On Friday, 22nd of August 2008 the Local Council of Arad City gathered to a festive meeting on the occasion of the Days of Arad 2008, in order to confer distinctions to personalities with extraordinary achievements in the social and art domains. The Diplomas were given by the Mayor of Arad City- Mr.Gheorghe FalcÄƒ and the two Vice-Mayors – Mr. Ovidiu Marian and Mr. Levente Bognar. To this event have been invited local officials, representatives of different religions and official representatives of twinned cities from: Gyula (Hungary) and Zrenjanin (Serbia) as well as Her Excellency the Ambassador of Romania in Hungary. 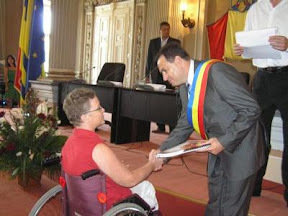 The Title PRO Urbe was given post-mortem to Mrs. Monica Antoci for her extraordinary activities for the protection of persons with disabilities. Romania / Arad, December 2, 2005 - The International Day of Persons with Disabilities, event proclaimed by the United Nations in 1992 and celebrated every year on the 3rd of December, will be marked on national level in Romania too within a national campaign of the civil society. "Take My Spot, Bear My Lot!" is the name of the campaign developed by 7 nongovernmental organizations that invite Romanian able-bodied citizens to understand the obstacles their fellow citizens with disabilities have to face when they try to live a decent life. A Conference on equal opportunities for people with disabilities took place on 9-11 December 2004 in Sofia, Bulgaria. As the European Commission finalised enlargement negotiations with Bulgaria and Romania and set out plans to start accession negotiations with Turkey and Croatia, this event brought together participants from these 4 countries. Joint European Conference on "Education and life-long learning"
Thessalonica, 1-3 March 2003 - As part of the European Year of People with Disabilities 2003, The European Trade Union Confederation (ETUC) and the European Disability Forum (EDF) organized the Joint European Conference o­n "Education and life-long learning" in the period between 1-3 March 2003 in Salonica (Greece).